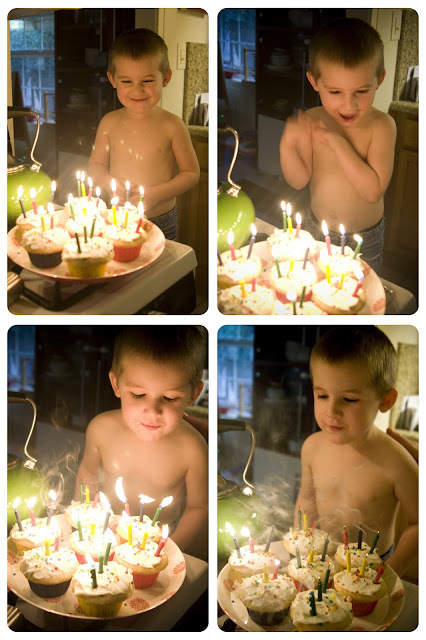 Lyndsay Johnson: Finn turns 4! My little man is getting so big! He had a fabulous fourth birthday yesterday. We hit up the Zoo, ate burgers, had cupcakes (with no rhyme or reason to the candles), watched movies, and opened lots of exciting presents. He felt very special, indeed! Happy Birthday Finn! am i wrong or is he and maya looking more and more alike? i also didn't realize how close in age him and my baylie are. she is four in april. by the way, four is one of my favorite ages. Happy Birthday, Finn the fantastic. . When you are 4, I don't think there is ANYTHING better than cupcakes, lots of candles and everyone singing "happy birthday to you" Well .... except maybe presents.